I had been looking to get a smaller wallet so when I saw the colorful designs of the new Tom Bihn wallets, Nik’s Minimalist Wallet, I ordered one in the color of Island in 210 ballistic. I chose design number 4 with the outside pocket and the little webbing loop at the top. I love it, it carries my essentials and is much less obtrusive in my back pocket than the old leather wallet I’ve had for many years. I usually carry it in my back pocket but sometimes I like to clip it into a bag using the loop. During the week I keep a credit card and my cafeteria rewards card in the outside pocket for easy access during lunch at work, and on days I have to stop for gas I’ll put the gas rewards card in that pocket too. 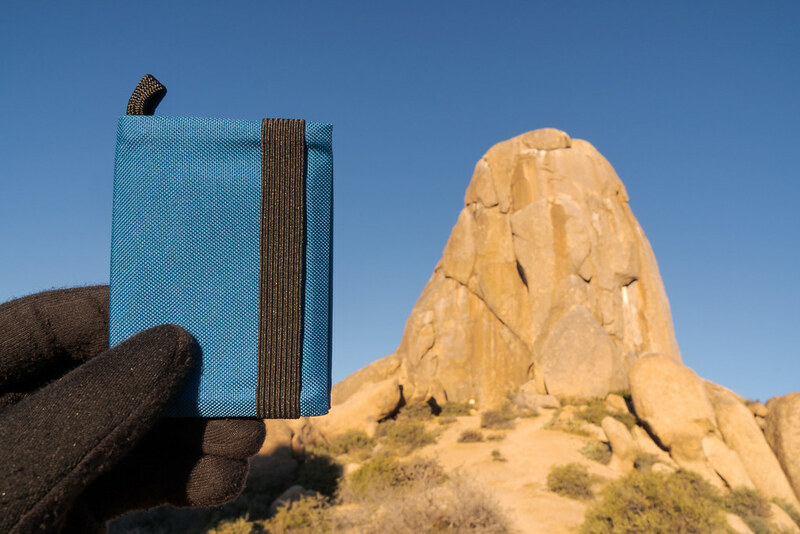 During a water break on a recent hike I photographed the wallet along with a couple of new buckle straps for securing my tripod to the bottom of my backpack (the Tom Bihn Guide’s Pack). I have been using some simpler lash straps without the buckle and thought I’d try the buckle straps to see if it makes it a little quicker to attach and detach the tripod. I’ll let my summer self decide, it’s his heat-addled brain at the end of a hike that I’m thinking of, so far my winter self has been happy with both designs. This spot is on the Marcus Landslide Trail in McDowell Sonoran Preserve, I discovered the trail last month and immediately fell in love and have hiked it a number of times since. The sign marks the boundary to an adjacent county park and has been a good spot for bird-watching, I’ve gotten close photos of phainopepla, white-crowned sparrows, mockingbirds, and curve-billed thrashers in the past few weeks. When I decide to head back to the car, the camera goes into my camera bag and I swap the tripod for my trekking poles that otherwise are folded up inside the main bag compartment. 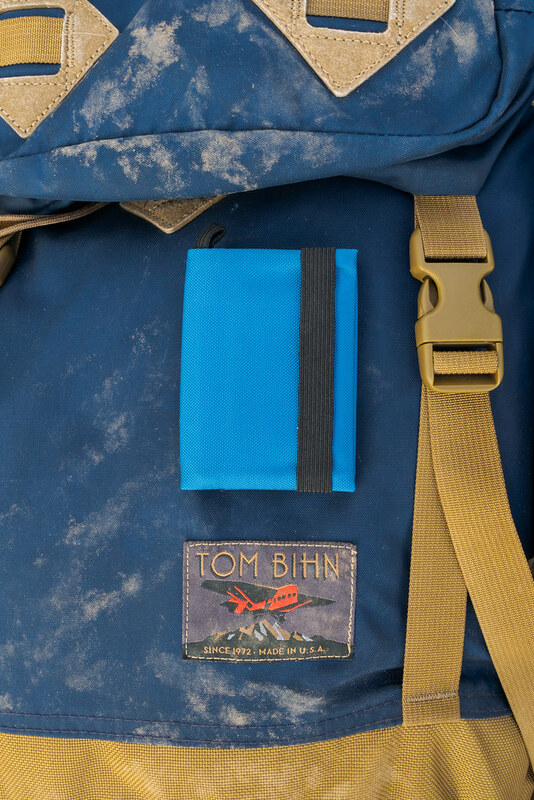 The specs of the little wallet are available on the Tom Bihn website but sometimes I feel photos give a better sense of size than numbers. 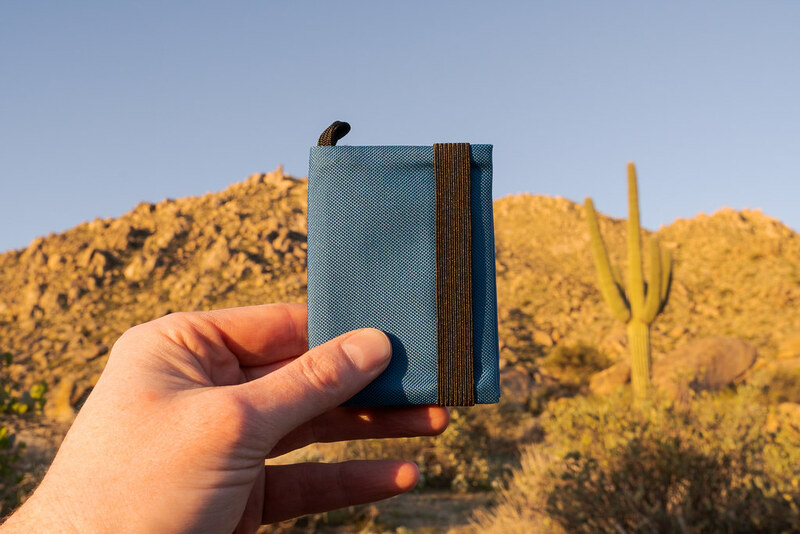 Here, taken in the area of the landslide itself, you can see the wallet is about as tall as a saguaro cactus. I’d guess this specimen was about 30 feet tall but I’m not good at estimating distances, so take that with a grain of salt. As another example, you can see the wallet is about the same size as Tom’s Thumb, a massive rock formation on the nearby Tom’s Thumb Trail. And yet somehow the wallet still fits in my pocket with minimal thickness and weight. Not sure how that works, but I love the wallet and highly recommend it. There was a time when we were preparing to move where I didn’t want to have to make one more decision, major or minor. 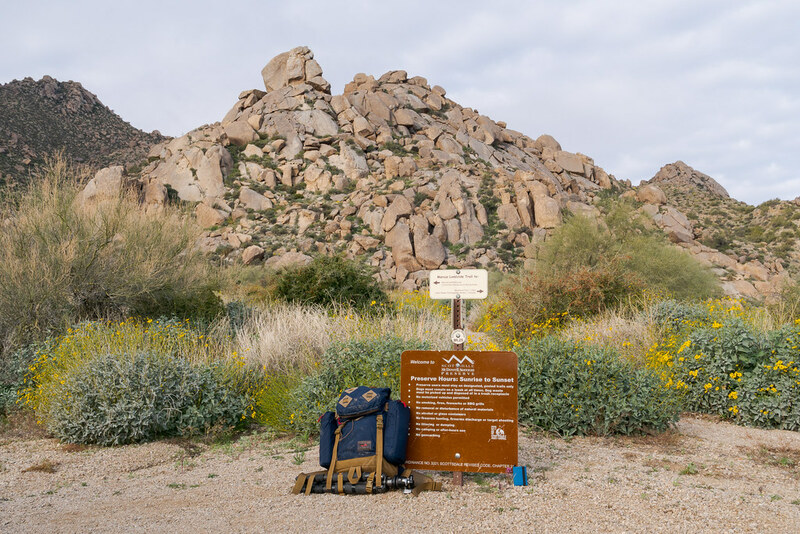 After arriving in Arizona there were plenty more decisions to be made, even for fun things like choosing new hiking gear for the desert climate. But as things slowed down I’ve taken the time to make some upgrades, some of which should have occurred a while ago but I didn’t have the bandwidth to deal with them. My laptop will be 5 years old in a few months and all is not well under its lovely exterior, a problem since I use it as my main computer. I was torn between a new laptop or a new desktop but neither was quite what I wanted until Thursday morning when I woke to news that Apple updated the 15″ MacBook Pro to my liking. After walking Ellie I ordered one before leaving for work, it should be here by the end of the week. As you’d expect given the age difference there are many improvements in the new laptop, the benefit I’m most looking forward to is 32 GB of RAM, four times what I have now and 50% faster too. The processor is much faster and with two more cores. The SSD is faster but more importantly will store twice as much at 2 TB. It has a dedicated video card (which I don’t think I care about one way or the other) but it has 4 GB of RAM itself which will be nice. All of which should making editing images a more enjoyable process. When I started shooting with the Sony A6500, its 24 megapixels compared to the 20 of my Canon 7D II seemed trivial but something crossed a threshold as editing those images became more painful, especially when trying to do quick back-to-back comparisons. I’ve also been holding off processing the 4K video I’ve started playing around with, that in particular the new laptop will be much better suited for, so I’m going to purchase Final Cut Pro and learn to edit video. I’ve been thinking about replacing my tripod head for quite some time now, it doesn’t hold the telephoto lens well when at an angle and the quick-release hasn’t worked well in years, so I purchased the Really Right Stuff BH-40 ball head. It went on my old Gitzo tripod and has been doing well with my 100-400mm lens. Here the pair are attached to the bottom of my Tom Bihn Guide’s Pack with my camera bag (an old Tamrac I’ve used since the 90’s when I got into photography) and Black Diamond trekking poles alongside, my setup after I put my camera away when the light gets too bright. I’ve had the poles a while but hadn’t used them too much until we arrived in the desert but I am loving them, they fold up so they go in the backpack until I’m ready for them, then I can get a good speed going with the poles and they are fantastic when the granite pebbles make the footing a bit dicey. They’re carbon fiber so they weigh next to nothing so I don’t regret bringing them on the rare day I end up not using them. I’ve always loved the 100-400mm lens for hiking, I got the original Canon version in 2001 and the updated version as soon as it came out in 2014. But here in Arizona I’ve found I prefer to use it with a 1.4X teleconverter and the Canon camera doesn’t work well with it, so I purchased Sony’s 100-400mm and teleconverter and the combination has been an absolute joy. I wasn’t expecting to use Sony for my wildlife work but I probably should have bought this lens when it came out, it’s fantastic (as is the Canon lens, my complaint is with the camera not the lens). 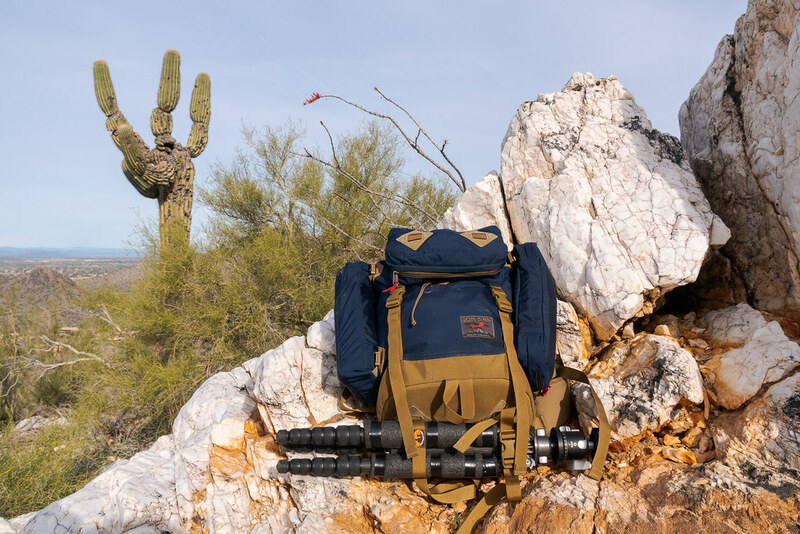 This was my setup at Cathedral Rock when I spent the morning photographing desert spiny lizards, got a number of great pictures thanks to the new gear. You might have noticed from the previous picture that there’s a new camera bag, it’s the Think Tank Photo Retrospective 20 (Sandstone). I used the old Tamrac on every hike for over 20 years, can’t believe how long it’s lasted! Most of it is still in fine shape but two of the three buckles that secure the top are down to one prong holding the clasp together, along with some other less severe problems. I’ve been meaning to replace it for years but it’s been such a great bag I was hesitant to do so, but with the new Sony gear the Retrospective 20 had a feature which pushed me over the edge: I can put the Sony 100-400mm with the teleconverter and camera attached into the bag, then easily retrieve it if I see something to shoot. 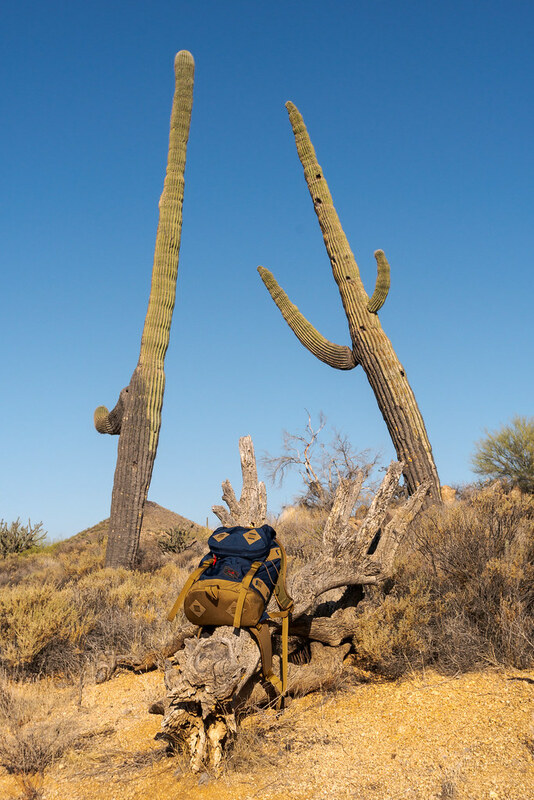 It’s worked out great so far, here it is next to my backpack beside my favorite saguaro. The long and short of it is, I’m happier hiking and getting better pictures and soon enough I’ll be happier editing them too. Before I go let me express my gratitude for Things by Cultured Code, I’ve used it as my task manager for a while now but the improvements they made in the last year or so really proved their worth from when I started looking for work to when we arrived in Arizona, I use it every day but on those days when so much had to be done in such a tight timeframe it kept me sane as well as on task. It syncs flawlessly between my iPhone, iPad, and MacBook Pro (I use it regularly on all three devices) and it’s a great balance of simplicity and sophistication. I bought my backpack, the Tom Bihn Guide’s Pack, four years ago and put it to use right away on a trip to Mount Rainier National Park and Olympic National Park in Washington. We spent our first years together hiking around the Pacific Northwest, not only Rainier and the Olympics but the Columbia River Gorge, the redwoods in California, the Oregon coast, and of course at Ridgefield. Designed and manufactured in nearby Seattle, it was right at home in its home. Then we moved to the desert. 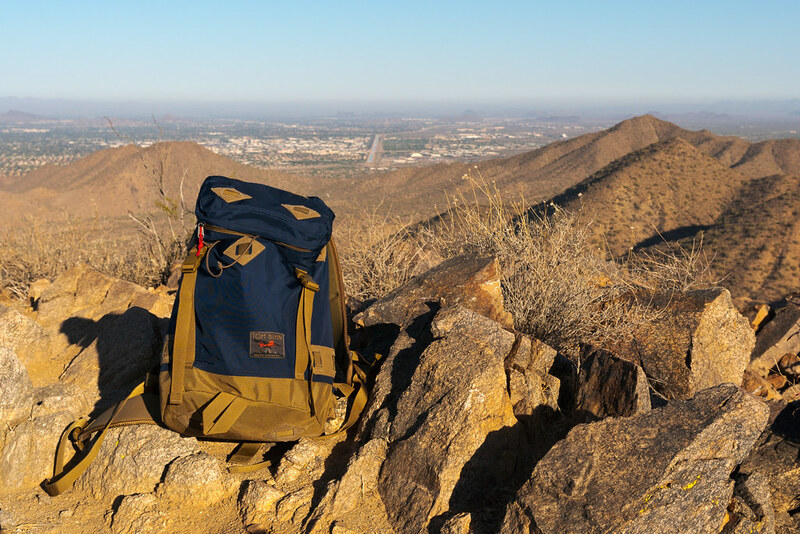 My first thought after moving here, unsure how I would handle hiking in the hotter weather, was to take a lighter pack on some short hikes, so for the first couple of hikes I took an old REI daypack I’ve had for over twenty years. 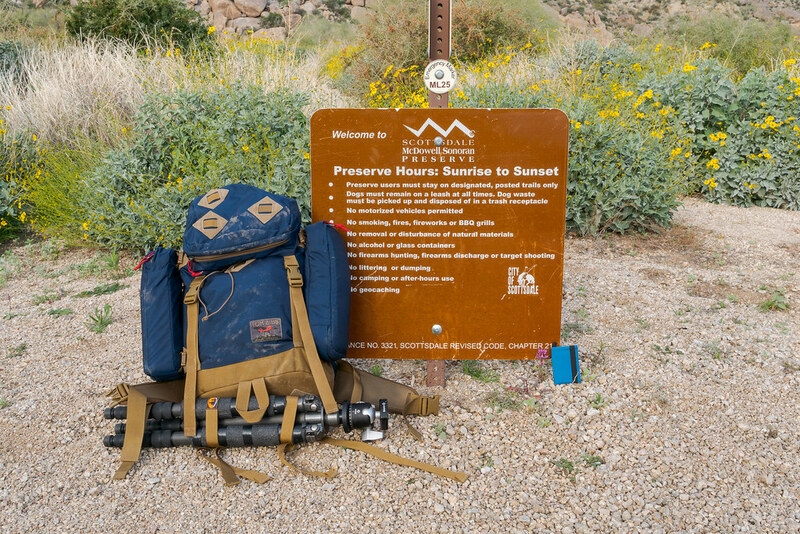 I quickly switched to the Guide’s Pack as I realized it was better suited to carry the water I’d need on longer hikes courtesy of its internal frame and hip belt. Since some of the trails are narrow my first thought was to take off the two removable pockets on the sides and store them in the bag. One of the pockets has an organizer for little things but the other is open, and it turns out it is perfectly sized to carry two 27oz Klean Kanteen water bottles. I carry one 27oz bottle attached to my camera bag, two in the side pocket, and a spare in the bottom of the backpack. But I quickly realized my mistake once I started putting my telephoto lens and camera into the bag when the light started getting harsh, as to get to the water bottles I had to pull out the camera and lens. You have to constantly drink water while hiking here, so easy access to water is critical. I put the pockets back on the sides where they have stayed ever since, and after looking in the mirror I realized they weren’t sticking out as I had imagined anyway. The bag is getting more and more dusty and that’s a good thing because it means I’ve been hiking more and more. I’ve been out almost 20 times in the two months we’ve been here and can’t wait for the next hike. 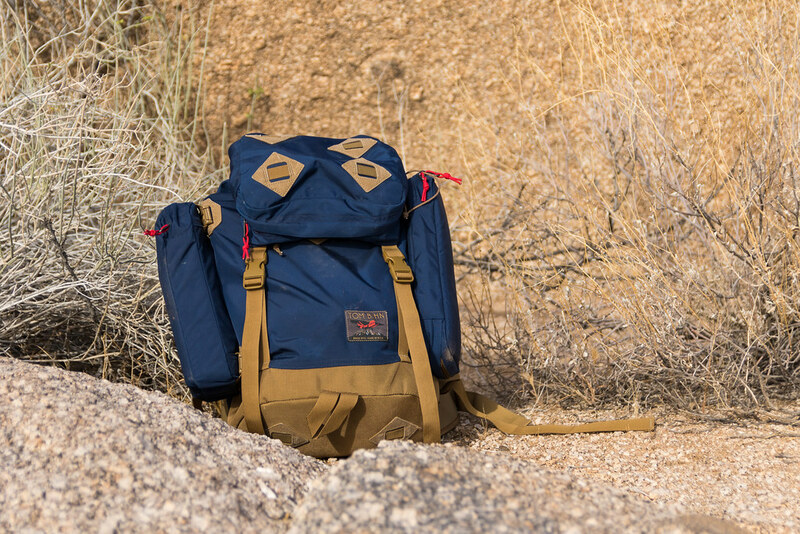 One of the things I’ve loved about this pack is its looks, the navy parapack material is both durable and gorgeous and is well-matched against the coyote brown bottom and straps. It’s a rucksack design, the top compartment is where I keep my snacks, you can open the zipper and get inside without opening up the pack. Pull back the top and there’s a cavernous compartment inside where I store my hiking poles, my fourth water bottle, a first aid kit, and extra clothing (if needed), and various other things. There are some o-rings inside for attaching stuff sacks, adding some nice organizational capability to the large space. My last adaptation in the desert was to start putting the big lens and camera away when the sunlight starts to get harsh, swapping the lens for trekking poles which make hiking in the desert more enjoyable. How I wish I had four arms so I could carry my tripod and trekking poles too! The tripod I cinch under the bag with some lash straps, that has worked a treat. 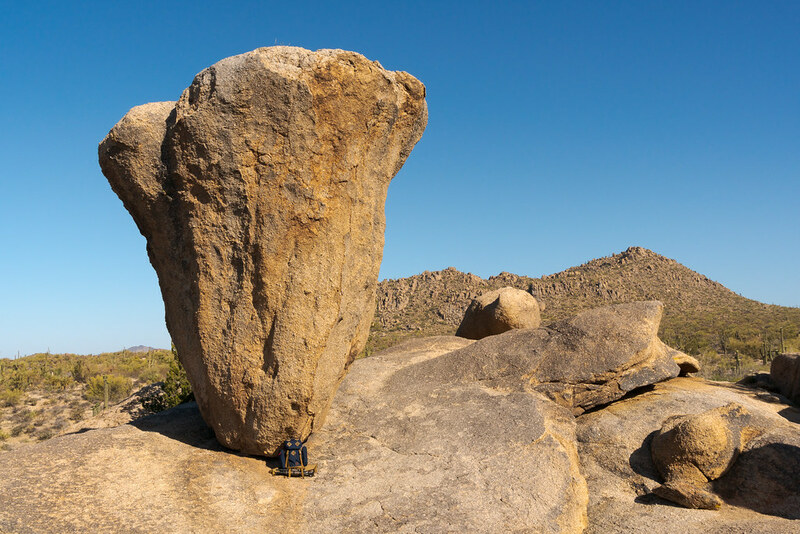 This is the configuration in the picture below, with the backpack and attached tripod holding up Balanced Rock. There are lots of nice touches in the bag, such as the loop handle that makes it easier to load the bag into the car or move it about the house. 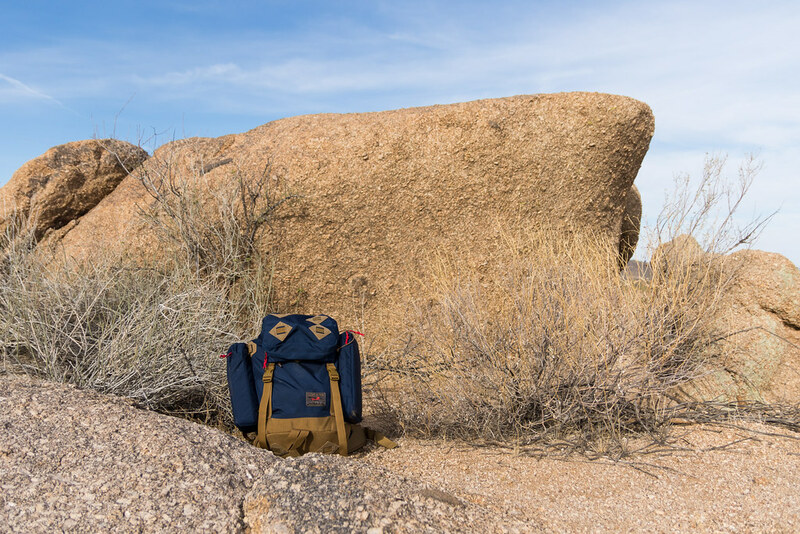 There’s a nice mesh on the back – your back does get sweaty in the desert, for summer hiking I might look for a back with a gap between your back and the backpack. Or maybe a lightweight pack if it proves too hot in the summer for any hike over an hour or two. I absolutely adore the Guide’s Pack. I love that its beautiful, I love that its well-made and made well, and I love that it’s a great backpack too. It broke my heart to leave the Northwest but getting to know the Sonoran Desert has been an absolute joy. My thanks to the folks at Tom Bihn for making the backpack that let me explore my home in the Northwest, and my new home in the Southwest. Leaving Portland means leaving a way of life. In our old neighborhood of Irvington I can walk to shops and restaurants. For most of our years here I’ve slung my Tom Bihn laptop bag over my shoulder and walked to the light rail station to take the train to work. I only drive about 1000 to 3000 miles a year, depending on how many long hiking trips I take, so I’ll drive as many miles on our way to Arizona as I might do in a year. It was obvious on my interview trip that life in Arizona will be centered around the car, so I’m going to have to get used to driving to work again. One of the things I’ll figure out during the year we’re renting is how long of a commute I can tolerate, which will dictate what neighborhoods we will consider when it is time to buy. There is more about Portland I’ve loved, from its progressive ideals (if not always progressive policies) to its eccentricities, such as the day I met someone walking a pig at the dog park. Not a little pot-belled pig, a full-grown pig. People practicing Shakespeare in the park, even our little Irving park. The old neighborhoods. The light rail. The downtown. The city parks. The duck ponds with not just mallards and Canada geese but wood ducks, bufflehead, wigeon, scaup. On and on. The ever-worsening traffic I won’t miss but we are heading to a much larger city so perhaps we will trade one type of traffic for another. Neither will I miss the ice storms, we’ll see if the misery of desert summers are a fair trade for wonder of desert winters. It was the lure of Portland that led me to interview with the company where I worked for two decades, the loss of that job is forcing me to leave. I will always treasure our time in Portland, it’s been a wonderful place to call home. Goodbye, I love you. 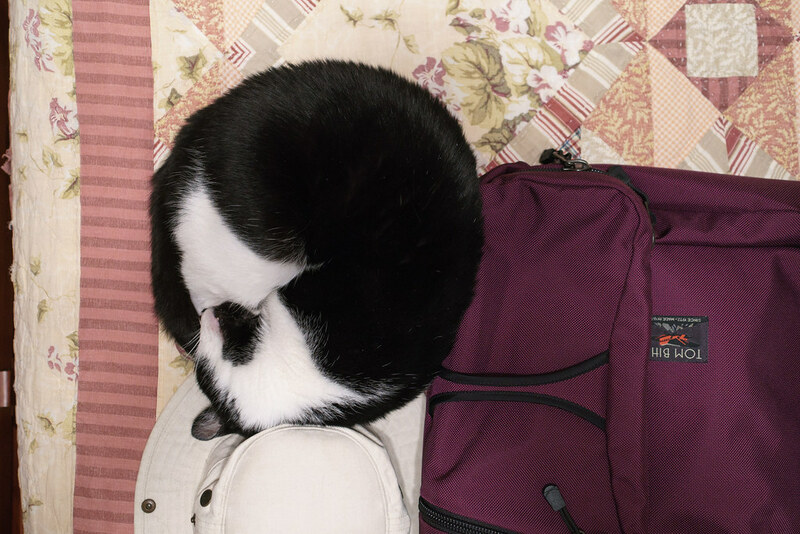 To prepare for my trip to Arizona, I started laying out on the guest bed everything I wanted to take with me and stepped away for a moment. I came back to find an extra item that I couldn’t bring with me, much as I would have loved to, but which will come along to wherever we end up. A quick shot of my travel bags after I got back from my trip to Arizona. I meant to photograph them together while on either my trip to California or Arizona but I kept forgetting, they were stressful trips as both travels were for job interviews. The bags worked a charm, as they always have, and were both easy to carry around the airport and easy to live out of during my stay. For the photo I didn’t take out all of the little accessory bags that kept me organized. 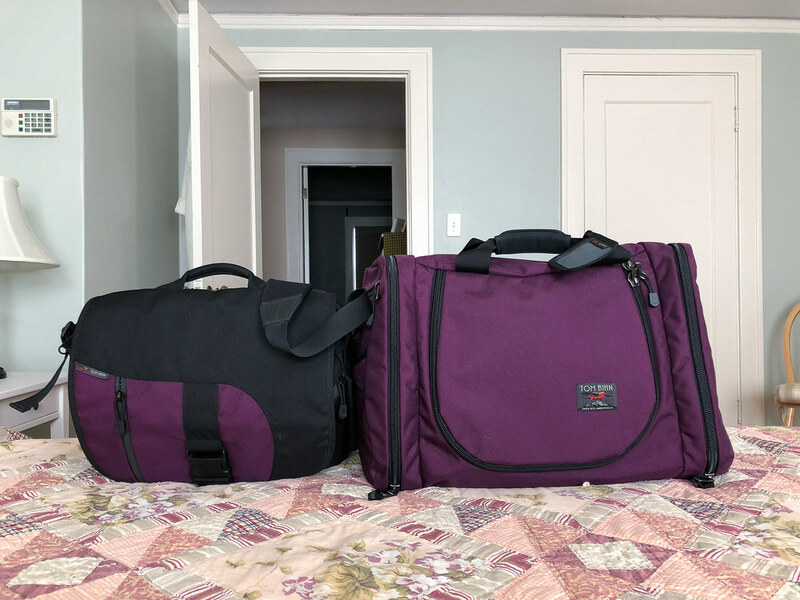 On the left is the Tom Bihn ID laptop bag that I used as my personal item, carrying my MacBook Pro and iPad, and on the right is the Tom Bihn Aeronaut 45 which I used as my carry-on. 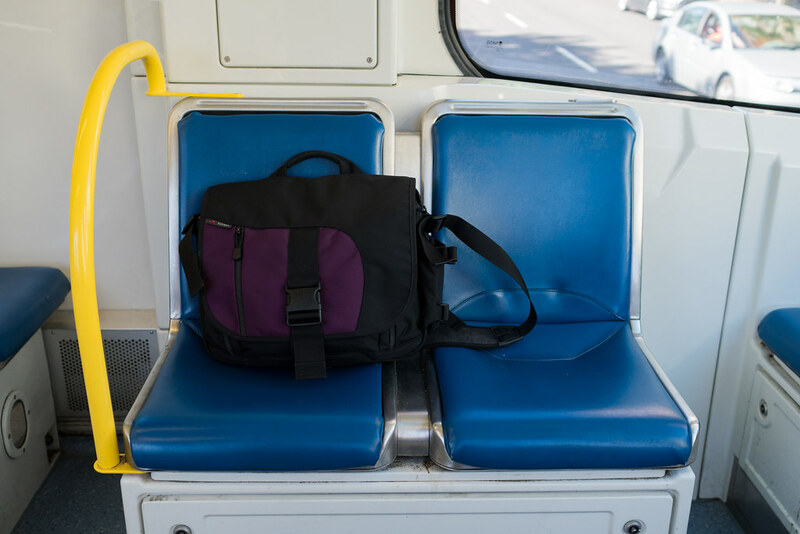 I love not only that it has backpack straps that can pull out to make carrying the bag easy, and be put away when you don’t need them, but that the whole process can be done so quickly and easily. Both of these bags were clearly designed and manufactured with a lot of care, which is why I love my Tom Bihn bags.